I mean, just look at him! He may want to wipe out all of humanity to achieve his twisted sense of peace, but I wouldn't say no to this little cutie, or any of his equally big-headed friends. 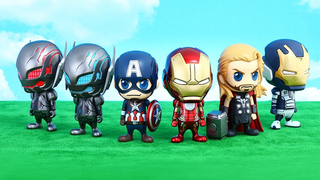 Hot Toys have finally brought back their Cosbaby series, just in time for Age of Ultron. These 'Cosbaby' toys are not a new concept for Hot Toys — the line has previously been used for the likes of The Dark Knight and Iron Man 3 — however it seems a little strange that they've brought it back for Age of Ultron considering they recently revealed a new line of artist collaborations for vinyl toys based on the movie that are a bit similar. But hey, are you going to complain about more Avengers toys? I'm not, but my wallet might. The 9.5cm tall figures are unbearably cute, even the decidedly angry-looking Iron Man, Iron legion drone and the two Ultron drones. They're available individually or as a set, which is the only way to get the 6th figure, the red-tinted Ultron drone. It's technically a Sub-Ultron rather Ultron himself, but it looks close enough to at least one of the Ultrons we'll see in the movie that it might as well be. I'm pretty sure the size of a toys head directly correlates to how adorable it is. Look at these cute little fellas all lying in a circle! It's not like they're going to duff each other up in an epic battle in like, just under 2 months from now, right? Hot Toys don't have an estimated release or price for these little darlings yet, but I'd expect them to be coming relatively soon-ish to capitalise on the release of Age of Ultron.